This time I guided a couple from Italy. We first met at JR station and headed for Sanjusangendo Hall. It has a thousand buddha-images in the main Hall. It is said that you can find very familiar face among them. Most of those images are national treasures. When you enter the hall, and just turn to the front of those images, you will be impressed very much. A thousand images welcome you calmly. The couple seemed to be impressed very much. Then we enjoy walking along the path called Sanneizaka, and Nineizaka. They especially were interested in insense sold at one shop. 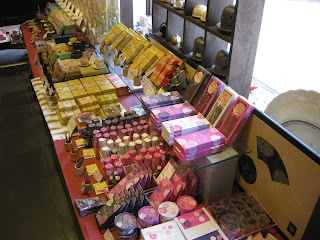 They have a variety of insense, with not only typical Japanese scent, flower-based scent but Tea flavored smells and so on. Just looking ( smell?) around some at the shop is also fun! 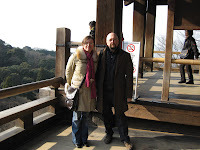 Later, we enjoyed Zen temple, Nanzenji, and went to Golden Pavillion after lunch. On the way back to the downtown, we went to Nijo Castle. We saw different kinds of temples and gardens, and last place to visit was Nishiki Food Market. We talked about Japanese food culture. The most intereseting thing for me was KAKI. We saw dried persimon hunging at some shops. I told them that they were persimon, but they didn't know the word. At the moment they say it might be KAKI. KAKI??? Yes, we call it KAKI in Japanese. KAKI, a fruit name has become an Italian word. That was very interesting. We fully enjoyed the tour.